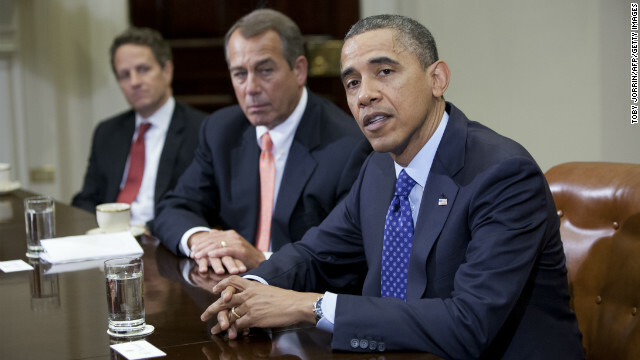 President Barack Obama and House Speaker John Boehner have disagreements about how to avoid the so-called fiscal cliff. (CNN) - The debate raging in Congress over the fate of our federal budget reminds me of the great judgment of Solomon. Here we are, sharp sword overhead, poised to cut the baby in half, just waiting for the voice of reason and a willingness to sacrifice. Instead, we’re confronted with arguments framed as a hard, false choice between sound economic policies and social programs, between fiscal realities and compassionate acts. It’s time to stay the sword. The truth is, at some point in life and regardless of income, virtually every American will benefit in some way from a social safety-net program, whether through a social security check, an unemployment benefit or a school lunch. Programs like these are called safety nets for a reason – yank them away and people get hurt, today more than ever. Take the special ed teacher’s aide I recently met. She has a full-time job that pays all of $17,000 a year. She works a second job to pay all the bills, but still must rely on a safety net to help feed her two kids. Because she does not earn a living wage, she has no choice. Yet some conservatives label her a “taker” and view her with contempt, judgments that are neither just nor wise. As we debate what to cut and keep as part of the spending reductions that will accompany coming tax increases, it’s time to be as wise as Solomon. The truth is, study after study has proven that basic, responsible social service programs like food stamps, housing credits and after-school programs actually work. Take child care. This single subsidy is a great multiplier that provides terrific return-on-investment as a service cost reducer and a job creator. Moms return to work and families earn – and spend – more. Employers get a more reliable workforce and children are safe. And we all benefit as taxpayers because it pumps money into the economy. Such programs are not a handout, they are a hand up. Safety-net programs that help low and moderate-income working families, as well as those among us who are elderly, poor, disabled and neglected, account for only 13% of the total 2011 federal budget. These aren’t Cadillac programs funding big-screen TVs across America. These are programs that help pay for education, affordable apartments and oil to heat cold rooms. More important to the fiscal hawks among us, these are also programs that help move the working poor into the middle class. I speak from the heart, but it’s my head and basic math that tell me that in our interconnected society, by helping one, we can help all. For the last 10 years, the so-called “job creators” have enjoyed significant tax cuts and tax breaks – thanks to a beneficent government – and we have yet to see the jobs. Perhaps the corporate titans should take a tip from one of their own, Henry Ford, founder of the Ford Motor Co. One of the richest men in the nation, but hardly a soft-hearted liberal, Ford doubled his employees’ wages in 1914, paying them enough to actually afford the cars they were making. Truth is, Ford knew he didn’t have to make a false choice between being a good businessman or a benevolent soul. He paid his employees a living wage because it was the shrewd thing to do, knowing that workers who have money spend money, and that helped ensure everyone’s well being, including Henry Ford’s. Imagine the impact on today’s gross domestic product if millions of low-wage working Americans, who got short-term help from a social service program with long-range goals, started earning a few more extra dollars. Like Ford’s workers, I bet they’d spend it. My organization, NETWORK, founded by Catholic Sisters 40 years ago, lobbies Congress for economic justice. Over the summer, we crisscrossed the country on a mission – dubbed “Nuns on the Bus” – to make elected officials aware of the danger in further enriching the wealthiest Americans at the expense of struggling, impoverished families. Our “Faithful Budget” calls for supporting public transit, job training, affordable housing near work – the sorts of programs that increase productivity and engagement in the economy. Ultimately, we need to pay living wages so far fewer working people rely on safety nets. But until that happens, the richest country on earth has enough loaves and fishes for all. It’s both compassionate and pragmatic to make sure that low-wage workers and their families eat, have places to live, and access to basic healthcare services to be productive members in our economy. When it comes to the debate before us, if enough voices of reason speak out – and both sides offer up something to sacrifice without harming people in need – we can all join together to help save both our nation’s fiscal security and its benevolent soul. The opinions expressed in this commentary are solely those of Simone Campbell. So many people believed that the earth was coming to an end on Dec 21. Notice that our senators and congresmen all flew home on that day, and the DOW went down since then. government is not the place for the "safety net". They eat up over half of it in administrative costs. It is not charity to have the government shake down the "giver" and redistribute the money. The sanctimonious liberal do-gooders are little more than thieves. I wish I could point to something the government does with compassion, efficiency and effectiveness; yet, you have not offered a better alternative. Sister Simone's message is consistent with the Old Testament, the New Testament and, I think, the teachings of the other major religions. How sad that Christians who pretend to take their Bible seriously cannot see its merits. But such folly is recorded in the OT Israelites whose greed drove them to give up their relatively egalitarian social system and to emulate the neighboring Amorites with their disparities from fabulous wealth to abject poverty. From a secular point of view, every democracy, ancient or modern, has at some point had to try to come to control the run-away wealth of the rich. Wealth compounds itself. Historically, no democracy has been successful, largely because money controls politics and democracy erodes smoothly into plutocracy. And, the end result has been ruin and the destruction not only of the democracy but the society itself. Will we never learn? AS FAR AS INCREASED TAXES FOR ALL- If the wealthy will have to endure a tax raise no matter what, let's go off the cliff and let everybody endure the tax raise compliments of Obama. Everybody paying they're fair share–I've heard "paying their fair share" may times–let's give the term some meaning for liberals. That is a very democratic thing to do. Going off the ficsal cliff will also eliminate most of the handout programs Obama used to get elected. LET'S JUMP!!!!! Everyone paying taxes for a change and the handout programs being cutoff. JUMP, JUMP, JUMP, I was Airborne for 20 years, you only need to tell me once. You obviously fell on your head too many times. Why did that special-ed teacher have two kids she can't afford to raise? And since she's come to the attention of the Catholic Church, why doesn't the vastly wealthy Catholic Church suppliment her income? It's easy to demand that other people pay to solve everyone's problems, but it's hypocritical. "Such programs are not a handout, they are a hand up." We've been hearing that line for decades. So why is the poverty rate in the US essentially unchanged after we've spent $20 trillion on the "War on Poverty" since it was started in the 60s? Where has the money gone? "More important to the fiscal hawks among us, these are also programs that help move the working poor into the middle class." But they don't! The poverty rate hasn't changed in decades. "Imagine the impact on today’s gross domestic product if millions of low-wage working Americans, who got short-term help from a social service program with long-range goals, started earning a few more extra dollars." The key word there is "earning." But to earn more, people need to offer more. By getting more education. By staying in school in the first place. By staying off drugs. "Ultimately, we need to pay living wages so far fewer working people rely on safety nets." But not everyone is capable of contributing the value of a "living wage" to an employer. McDonalds can only afford to pay so much to people to flip burgers. "The opinions expressed in this commentary are solely those of Simone Campbell." And Simone Campbell's wishful thinking is what's bankrupting Europe. "Why did that special-ed teacher have two kids she can't afford to raise?" You of course are blessed with prescient knowledge and can predict that some time after the birth of children you will always be able to afford them. You are blessed with the ability to see berievement, redundancy, being abandoned. Can you not see that some things can occur that change ones life and we may need support. "why doesn't the vastly wealthy Catholic Church suppliment her income?" I agree, but by that reckoning the even wealthier USA should contribute. "Such programs are not a handout, they are a hand up." Since you go on to say that "why is the poverty rate in the US essentially unchanged " can you point to the success of "trickle down economics"? Obviously that hasn't worked either.
" to earn more, people need to offer more. By getting more education." And how can they afford that if they can't afford to eat or live? Are you prepared to see people die on the streets from hunger, cold or illness? Are you prepared to condemn those who through misfortune or the inability to change their lives to death? And you wonder why people resort to crime to survive. You wish to reduce the surplus population (ie – The Takers) though what means? Slow starvation and homelessness? Death from some preventable or curable disease from a lack of health care? Certainly a great many of the elderly will be the first to go. Then, impoverished chidlren will ne next. Perhaps firing quads for the remaining adults? Some other means? Let's hear it. The problem is that these social programs are broken and wasteful. I know far too many personally who are abusing the system and defrauding the govt. Then why aren't your REPORTING those you personally know who are defrauding the government and abusing the programs? Try FIXING the programs instead of simply eliminating them. Not all jobs can, or will ever, pay a "living wage". Sorry, some jobs wages just aren't sufficient for an individual, much less a family. Sister – Why don't you shed some light on why your teacher's aide needs help. ?Why for example is someone making 17,000 per year raising one child much less two? How about her husband's income? The scripture is quite clear on our obligation to help neighbors in need – but it is also quite clear on the need for individual thrift and personal responsibility. Vilifying hard working Christians for their success is in itself unchristian – particularly when many pay more than 25% of their production in taxes – as is using the scripture to advance one's personal agenda. Our good Lord is indeed compassionate but he is no socialist and in my reading of the scripture he disdains it. I can think of a number of reasons why someone might have children that they might find they cannot afford. none of which would be their fault. How about being widowed after giving birth? The father running off? Since we are not told in the article we cannot know but that is no reason for anyone to start vilifying anyone before you have that information. I refer you to John 8:7. If you are a true christian you should have more compassion. @ZifMeister: "Vilifying hard working Christians for their success is in itself unchristian"
Have you not read the bible? It condemns accumulating wealth. You just called Jesus and God unchristian. Jesus said to give away EVERYTHING one owns. Yes, even your iPhone. "[it's unchristian] ... as is using the scripture to advance one's personal agenda"
This is nearly the definition of any religion. Refer to some "holy" text which can be interpreted many different ways given a situation, and then indeed interpret the one way that suits your argument of the moment. "Our good Lord is indeed compassionate but he is no socialist and in my reading of the scripture he disdains it." Of course, some argue God was indeed a socialist. Let's Keep Evolving, Don't forget to include all the pro ball players with their million dollar contracts. The Tel Evangililst with their millions, Let's also not forget all the current, past and future congressmen/senators with special retirement, health care, pensions, etc. that add up to you guessed it, millions. The list goes on and on. I agree the CEO's make too much money, but a lot of others who are never mentioned can certainly pay more too. Let's also don't forget some people planned ahead and shouldn't be gouged because others didn't. This country is on a fiscal cliff but it isn't the one in the news. It's the one where you have more people voting how to spend peoples money who work when they themselves don't contribute a dime. Guess what, they will vote to spend everything you have since they have absolutely 0 invested themselves. Right on you yanks. About time you coughed it up for the underprivileged. We in the UK love our estates and DSS money. Soon you yanks will be in the same position. You call them leeches, we call them pikeys. I thank the labour party every day for the freedom to live my life as I want, and the taxpayers pay for it. Why doesn't anyone get the larger picture? Of course this is income redistribution at its core, but how he hell are we supposed to sit back and watch millions of hard working Americans barely get by with $20K salaries? There is so much wealth in this country and everyone acts like the CEOs who set their own salaries at 20 million per year is completely righteous while familes struggle. That's where Obaman is coming from. I make good coin myself but understand our larger challenge to not have a living wage for all "career" Americans. Very few CEOs make 20 million per year. There are some, mostly of larger companies. Let's see, CEO making 20 million per year, with 40,000 employees – If he distributed all of his wages among all of his employees, it would be an extra $500 per year for each employee. I am not saying that he deserved 20 million; I am saying that his salary is not the problem. Compassion does not come from the goverment forcing people to pay for others. Compassion only comes from choice. Obama and the other demagogues screaming "compassion" have none themselves. They are fighting a class warfare between the ruling rich and the productive rich. They are stealing from the productive rich for the benefit of the ruling rich. They have used lies to enlist the poor as cannon fodder in their war. But the poor will never benefit from these attacks on the productive rich. The poor will be far worse off as a result of believing the lies of the ruling rich. Tell me. how productive is a CEO, really. And of that productivity how much of their salaries are justified by that productivity. So much of what passes for stategic business thinking today is geared toward increasing the dividend at the expense of innovation, product quality and service. How many businesses like Kodak and HP are failing because their CEOs lacked a true knowledge of hebusiness they are running. This is where the problem lies. this strategy. And all of it somes at the expense of the employees.